This beautiful pewter piece features a fairy in a little leaf boat! 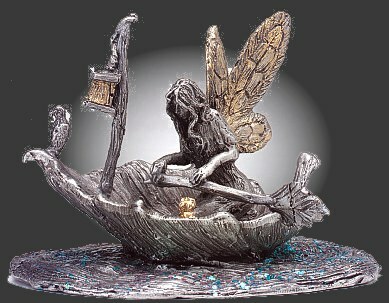 The pixie has golden wings and rows her small boat along, using a leaf on a twig as her paddle. A lantern is hung from the mast of her tiny ship. The perfect gift for any faery-loving adventurer in your life! 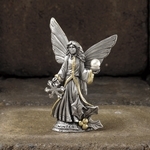 Pewter Fairy by Rawcliffe Pewter Studios Figurines & Figures, Fantasy collections.